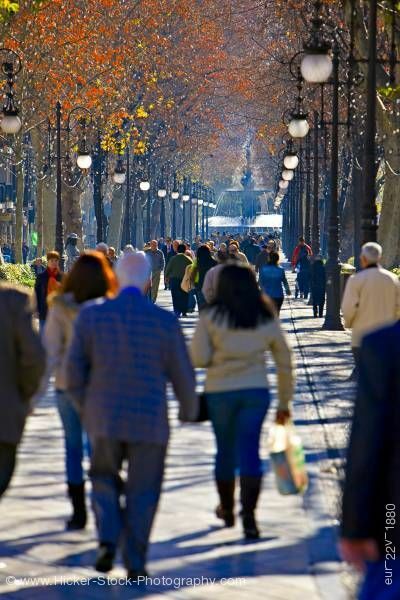 Stock photo of pedestrians along the Carrera del Genil, City of Granada, Province of Granada, Andalusia (Andalucia), Spain, Europe. A beautifully sunny cool day with people walking along the Carrera del Genil, City of Granada. This stock photo shows a pedestrian zone along Carrera del Genil, City of Granada, Province of Granada, Andalusia, Spain, Europe. People, in their winter clothing, are coming and going fill the walkway. On both sides of the walk area are several tall ornate black wrought iron lamp posts each with a swirled handle for the large frosted white globe. The lamps form a long straight line on the border of the walk. Tall trees in their autumn colors of red, orange, gold and yellow are on both sides of the walkway form a canopy over the pedestrians. The sun streams through the trees leaving shadows on the walk. The backdrop is a large two tiered water fountain that can be seen at the end of the busy walkway. Pedestrian zone along Carrera del Genil, City of Granada, Province of Granada, Andalusia (Andalucia), Spain, Europe.